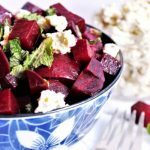 This easy vegan beet salad is topped with mint and vegan feta cheese making it the perfect flavor combo while being dairy free and gluten free too! It makes a beautiful side dish, a healthy lunch, and the ideal vegan picnic food. This salad is a colorful side to dress up any plate! Why put mint in this salad? I saw a recipe years ago that called for a mint dressing on beets and I’ve been hooked ever since. You can leave it out, but if you have never had mint and beets together before, I urge you to give it a try! What type of beets do you use for this salad? If I have time, I buy fresh red beets from the store and boil them. It takes a while, but it’s very easy. If I don’t have time to cook my own, I buy the pre-cooked and peeled beets that come vacuumed sealed packages. They sell these at Trader Joe’s, Costco an many other grocery stores in the refrigerated produce section. They are ready to slice and eat, so you can have this salad done in minutes! How do I boil beets? 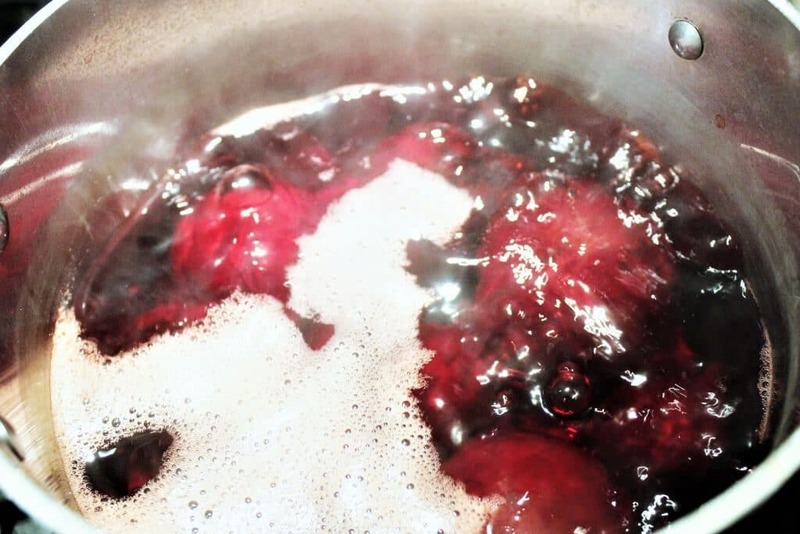 Fill a pot of water large enough to cover the beets completely, and bring them to a boil. Let them boil slowly for about 30-40 minutes until you can stick a fork in them and reach the center without too much effort. Drain the beets and let them cool. Cut the rough top and bottom off of the beets and rub them until the skin peels off. (Rubbing them with a paper towel gives you some friction to get the peel off). 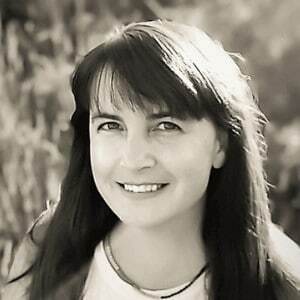 Once boiled and peeled, they are ready to be cut up. How do I make the vegan beet salad? Dice the cooked beets into bite-sized cubes and toss them in a bowl. Toss in some chopped fresh mint and give it all a stir. Top your salad with vegan feta cheese and you’re done! What type of feta should I use? They now sell a few brands of vegan feta at large natural foods stores. If you are lucky enough to find them they are pretty good. I have used them before, but my family actually prefers my homemade vegan feta made with tofu. Either way, feta is a delicious addition to this dish! Tip: Do not stir the salad around after you add the feta if you want it to stay white. 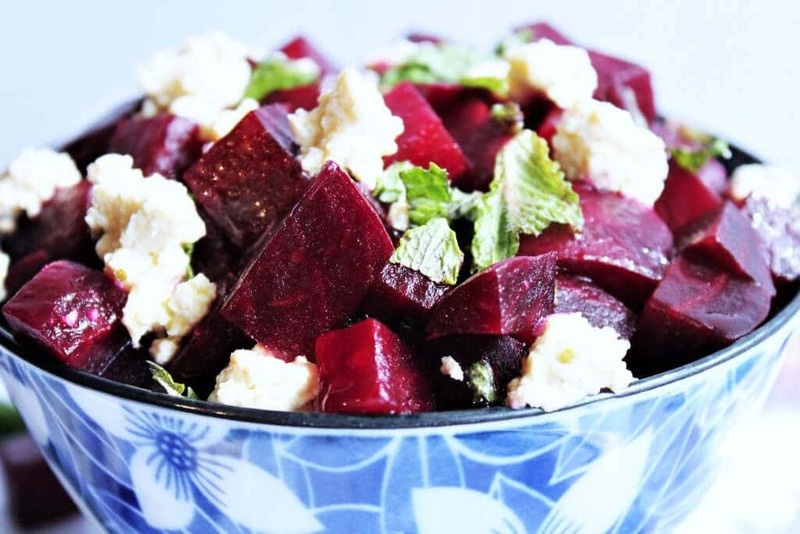 The beets stain the feta a beautiful pink color. It’s not necessarily a bad thing but should be noted. Do you like vegan feta on your salads? Try this vegan Greek salad with vegan feta! A simple easy pasta salad perfect for a quick meal or a picnic! 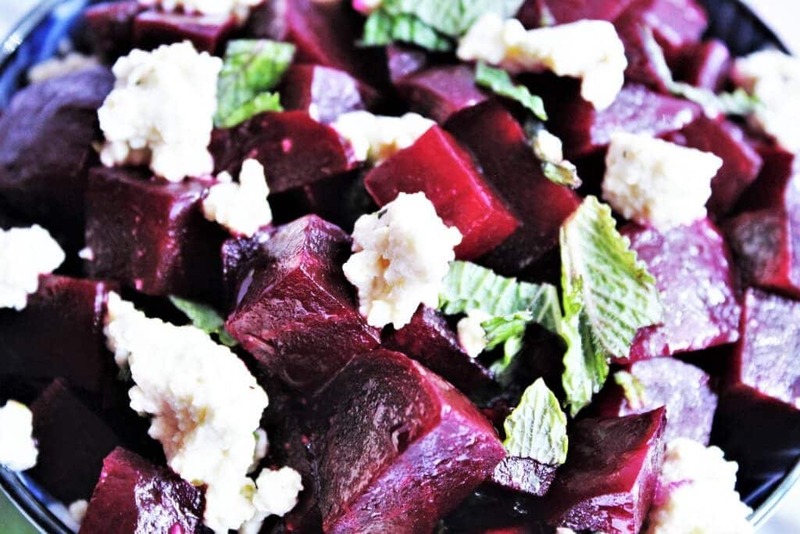 Don’t forget to pin this vegan beet salad recipe for later! 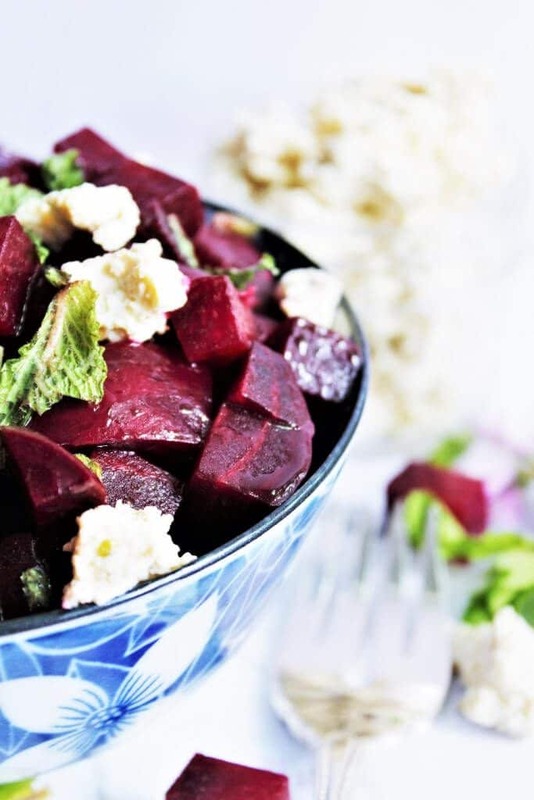 A gluten-free and vegan beet salad with vegan tofu feta and mint. Cut cooked and peeled beets into bite-sized pieces and put in a bowl. Drizzle with oil and toss in mint and salt. Mix well to coat the beets with oil and salt. Top with crumbled vegan feta or homemade tofu feta. Fresh cooked beets will have a more vibrant color. Pre-cooked beets will save you time and effort. You had me at beets, but the feta really sealed the deal. This is going to be the perfect side for an upcoming picnic! This came out great! So easy and so pretty! Thanks for the recipe! I love the color of this too! So happy that you liked it!